Today we’re happy to share a photo essay by History major and department TA Connor Larson ’17, who spent Interim in Europe with Profs. Gehrz and Mulberry and nineteen other Bethel students. 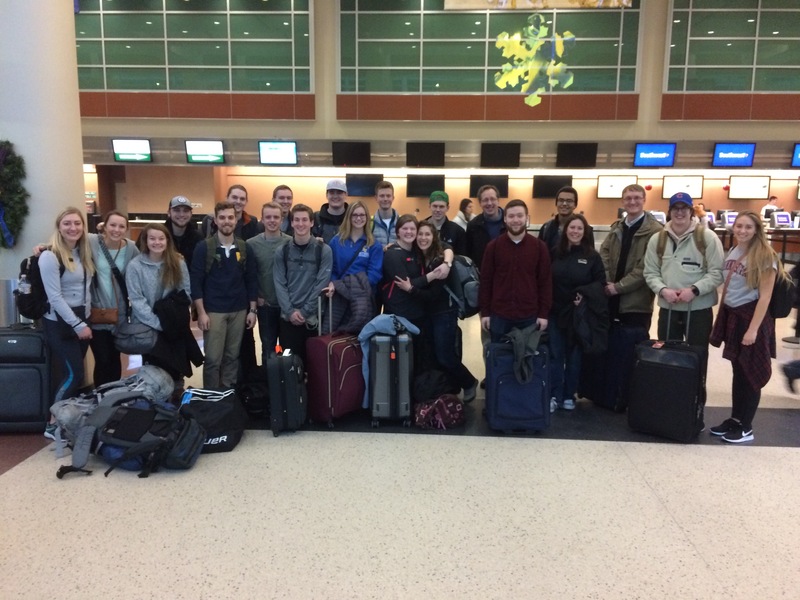 The J-term trip through Europe studying World War I and its effects on society and culture was a resounding success. Here is a glimpse at some of what we did. The trip began with a layover in Iceland. Unfortunately that layover consisted of a brisk walk to the next flight. Upon arriving in London and passing through customs we quickly unloaded our luggage at the lovely Wombats Hostel and began our journey. Although jet-lagged and disoriented the walking tour went well, fast-walking tour guide and all. Trafalgar Square was one of our first stops. Despite the jet lag everyone was having a great time. The Lion of the Midwest. One of the amazing things about London is the vast amount of memorials and monuments for the numerous wars and events the country has been involved in throughout its history. Luckily for us that means there was no shortage of WWI-era memorials to examine. For many of the memorials visited in London the students gave lessons on the importance of the memorial and influence of those honored both in the war and in the years after. One of the highlights for many on the trip was a visit to the Imperial War Museum, and it was an experience many would never forget. Our trip, while grounded in the First World War, spent an equal amount of time on the impact of war on society by looking at the arts (primarily fine art and poetry). Art and war are deeply connected, and through our museum visits we were able to see how the war affected society in a way that books and artifacts rarely have an ability to portray. I am omitting photos of this portion of the trip because I believe the impact of what we read and saw would be reduced in such a degree where it would be a disservice to attempt recreating it here. On our free day many of us went and stormed Dover Castle. Here is our journey. On the train to Dover, Brandon Sebey ’17, History and Social Studies Ed major, does reconnaissance to create a plan of attack. On the bridge into the castle, we are surprised at the ease of entry. The future queen overlooks her new domain. She is not impressed. When I picture British landscapes this is what always came to mind; was not disappointed. We have made it to the castle roof, victory! Talking about the successful storming of Dover Castle. The new leadership takes the throne of Dover Castle. All joking aside, it was an amazing experience and a great opportunity to learn about both medieval and modern history, as the castle and town played an important role in both World Wars. To wrap up our time in England here are some more photos that are neither educational nor related to World War I. The few days spent exploring the front lines of the war were the climax of the trip for most, if not all, of us. Despite our enthusiasm none of us were ready for the emotional toll this portion of the trip would have on us. Reading about casualties and statistics pales in comparison to seeing the hundreds of grave sites scattered around Belgium and Northern France, let alone the front lines throughout the rest of Europe. Here, for example, are some photos from the former military hospital near Poperinge, Belgium. Langemark was the first German cemetery we visited. Where American deceased were sent back to the states and British troops given individual graves in the field where they fell, German soldiers were given a much different burial. German soldiers were soldiers for their fatherland first, individuals second. Individual graves were time consuming and costly to the war effort, meaning that mass graves were common behind the German front lines. This is not reducing the individual to nothing but rather putting the state in front of oneself, an important distinction to make. The central open area is a mass grave of 30,000 soldiers. The names of each soldier etched on the tablets seen above. Each gravestone represents 5,000 German soldiers. As we went from one grave site to another many of us had trouble fighting off the inevitable desensitizing nature of witnessing the aftermath of so many lives. As difficult as it was to witness the amount of lives lost we would rather feel that weight than have those emotions watered down in the face of incomprehensible numbers. We visited various memorials during our time in Belgium and Northern France as well, including one honoring the sacrifice of Canadian soldiers in the war, specifically at Vimy Ridge. Along with the beautiful memorial pictured above, the Canadian government, when given the choice to do with this land what they wished, opted to preserve the landscape, keeping it in the same condition as it was immediately after the war. The only changes were in trees that had been transplanted and grass that has been grown there. Here we see a man outstanding in his field. We were given the opportunity to walk through recreated trenches at Vimy Ridge, giving a feeling for the distance one would have had between the enemy and themselves. Our guide, Carl Ooghe, giving the class a very animated lecture on the importance of mortars during the war. The cement structure in the foreground is the “enemy” trench, a distance much shorter than one may think. Brandon keeps a keen lookout from his fortified bunker. While we visited numerous other memorials and cemeteries in our time we had to move on, visiting somewhere completely different, both physically and mentally. To say that Paris was a shock after travelling the French and Belgium countryside for the past few days would be an understatement. On top of the new city and transportation system to learn, we struggled with a language barrier, general travel fatigue, and the mental drain of visiting and seeing all that we had in the past few days. A chilled sunrise over Paris. Much like our time in London, Paris occupied our time with walking tours of famous monuments and visiting various museums located throughout the city. Our museum and transit passes (included in the trip) filled our stay with fine art and exploration. The Louvre was an incredible journey of art, history, and architecture. While the English may have created the first Tank, the French gave us the turreted top-gun. Yet again, not all of our time was devoted to the history of Europe. Much of our time was also spent enjoying the city. There is one last thing that we did which has a special place in the hearts of everyone who was on this trip: The Handball Tournament. Both Dr. Gehrz and Prof. Mulberry mentioned this optional outing while we were touring Belgium and Northern France. After everyone decided to go, they feared that an overstatement was made in how great it would be. If their visions of grandeur were anything, it would be understated. Handball is easily one of the most fun sports to watch, and although the stadium was mostly empty we certainly made enough noise for everyone who was absent. We had no ties to either team playing, confusing those around us as we cheered for everything that happened. Many came out without a voice and the events that went down in that stadium will never be forgotten. If one thing prepared us for coming home during our last week in Europe it was the weather. Munich was by far the coldest location we visited, although not as cold as the Twin Cities while we were away. Our standard walking tour, while cold and windy, gave our tired feet a brief respite; snow is much softer to walk on than cement. The train to Salzburg was a whimsical affair. As the trip progressed my photography effort declined due to a combination of fatigue, overload, and a desire to be more fully enveloped in the experiences of the trip. As great as documenting a journey such as this can be you end up focusing more on getting the right shot rather than enjoying the right moments. There is a balance that I have yet to discover, but for now I am glad I can look back at everything we had been through and all that we had learned. The flight home seemed to take twice as long as the journey taken a few weeks prior. As with all ends to great adventures the homecoming was bittersweet. I think we all were glad to be home, thankful for the experience, and sad to have it be over. I hope that as many people as possible get the chance to travel and expand their thoughts and horizons, and this trip was a great opportunity to do just that. We were able to learn more about ourselves, new cultures, and a pivotal moment in history that affected nearly every nation in the world.